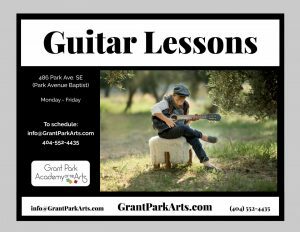 Private and small group guitar lessons are available at your neighborhood music school, Grant Park Academy of the Arts. Lessons available Monday – Friday at 486 Park Ave SE (Park Avenue Baptist Church). Please inquire: email or (404) 552-4435.